Saturday, March 23 is National Puppy Day 2019, which is basically a John Wick holiday. So the account for the upcoming movie John Wick: Chapter 3 – Parabellum issued a new trailer – rated “GB for Good Boy” – re-cutting scenes from the franchise to focus on the tender love story between a man and his dogs. You’d never know the scenes came from three films about an assassin getting extremely violent revenge. John Wick started with the death of the former hitman’s wife Helen. Helen had gifted John a Beagle puppy, named Daisy, to help him in his grief. Then Russian gangsters showed up demanding to buy John’s car. Mr. Wick refused to sell, so they caught him off guard at night, knocked him out, stole the car and — deep breath — killed little Daisy. Killing the puppy crossed a red line for John Wick, and he returned to his life of crime to get revenge. 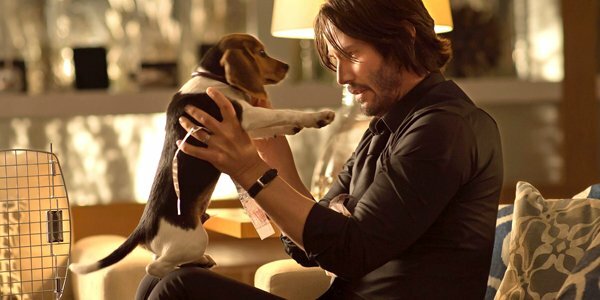 John Wick also got himself a new puppy at the end of the first movie, adopting a pitbull who would’ve otherwise been put down. Now John Wick and his new dog are on the run, as the third movie — out in theaters May 17 — finds John with a global contract out on his head. In the movie, he reconnects with Halle Berry’s character Sofia, who knew John in the past and has two dogs of her own. Those dogs are basically her action scene sidekicks, so John Wick 3 may turn out to be The Revenge of the Dogs. Fun fact: Chad Stahelski, who directs these John Wick movies, was Keanu Reeves’ stunt double as Neo in The Matrix movies. That’s how they met, and now here they are, offering puppy videos to the internet on national holidays.